The game on New Year’s Day at Macclesfield Town will not now be all-ticket. The east Cheshire club have announced that supporters without pre-bought tickets may now also pay at the turnstile’s on the day. The change of plan is due to less than anticipated numbers of tickets sold. A well-taken goal seven minutes from time by Michael Branch rescued a point for City at Rochdale after the Blues had seen their early lead wiped out by the home side midway through the second period. Kevin Ellison had given City a dream start on six minutes lashing the ball home at the far post following good work from Branch to the delight of the large away support. However the home side hit back after the break with two goals though Leo Berton and Taiwo Atieno and looked to be heading for all three points before Branch’s late solo strike brought a point. It’s two months since the Blues last scored two goals in a league game and the point leaves City still in 19th place ahead of the next game at Macclesfield Town on New Year’s Day. The match at Moss Rose will kick-off at 15:00hrs. Both Michael Branch and Andy Harris picked up their fifth yellow cards of the season at Rochdale and have received a one match suspension, they will miss the forthcoming FA Cup tie at AFC Bournemouth on 8 January. Kevin Ellison’s first-half equaliser brought City a deserved point against the league leaders Scunthorpe United at Deva Stadium. Earlier, Steve Torpey had given the visitors the lead as early as the third minute. The point leaves the Blues still in 19th place ahead of Tuesday’s Bank Holiday clash against seventh placed Rochdale at Spotland, kick-off 15:00hrs. One player who looks sure to miss the game is goalkeeper Wayne Brown who suffered a back injury on Saturday and was replaced by Chris MacKenzie midway through the second half. The squad will be in for training later today. Manager Ian Rush (left) is determined that his side will be in the right shape for Sunday’s Boxing Day clash with league leaders Scunthorpe United at Deva Stadium (kick-off 15:00hrs). “We have decided to get the players in for training at 6pm on Christmas Day, simply because we will know who has been following the rules and who hasn’t, We will soon tell who has been over-eating or having a drink too many. It is vital to conduct ourselves in a professional manner, The lads have had their Christmas party and enjoyed it, but now it is back to business. Players have to remember that supporters usually turn out in bigger numbers than usual on Boxing Day and New Years Day, so we must be in a position to give them value for money.” Rush told The Chronicle. There are doubts over the fitness of Michael Branch who has a hamstring injury but Kevin Ellison returns to the side following suspension. Another experienced player from last season’s championship side, wing-back Kevin McIntyre, has moved on. He has signed for Cheshire League Two rivals Macclesfield Town. McIntyre joined City in May 2002 from Doncaster Rovers and has played 102+3 games for the Blues, scoring three goals. Good luck to Kevin. City have taken 19-year-old Preston North End midfielder Michael Brown on loan until the end of the season. Brown, who has yet to make a first team appearance for the Deepdale outfit, was signed after impressing Ian Rush in a recent trial game. “I got asked to go down for a trial game at Chester. I had a word with the manager there Ian Rush, and his assistant and they wanted me to come down for the rest of the season. Obviously the Christmas period is always busy so it will be good to get a few games under my belt because I don’t think there is a reserve game until maybe next year. I need to get a few game under my belt there and score a few goals and help keep them up.” Brown told the Preston website. City chairman Steve Vaughan is as anxious as anyone to see a striker brought on board before the next league match against Scunthorpe United on Sunday. “I spoke to Ian Rush following the Southend game, and we will intensify our search for strikers. It may be that we offer certain players from our squad plus cash if any deal is to be secured. But one thing is for sure, we need to move smartly this week. We want somebody in before Christmas, and we are working all hours to bolster our squad.” said Vaughan. 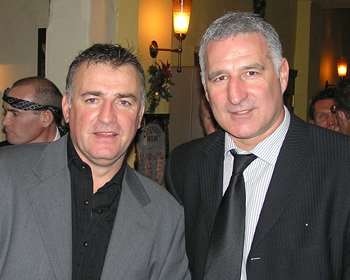 Former managers Kevin Ratcliffe and Graham Barrow. • A report and pictures of the day can be read here. City suffered a 1-0 defeat at Southend United on Friday night that leaves them still in 19th place in League Two and without a League win in their last seven games. As expected both Luton Town loan players, Ian Hillier and David Bayliss, player their part and both fitted in to the side quite well. Cortez Belle passed a fitness test to play though defender Richard Hope was sidelined. To add to City’s woe, striker Michael Branch limped off after just 15 minutes with what looked like a hamstring pull, if that is the case he could well be sidelined for the busy Christmas period. The only goal of the game came two minutes from time as substitute Lawrie Dudfield seized on a poor clearance from Andy Harris and made no mistake from close range. The youth team also lost 1-0 at the weekend, at home to league leaders Port Vale on Saturday. City make the long journey to Southend for tonight’s League Two clash looking for an improvement on recent form that has seen them pick up just three points from the last 18 available. New loan signings Ian Hillier and David Bayliss are expected to feature but both Cortez Belle and Richard Hope are both carrying knocks. Hope was injured in last weekend’s fiery game with Shrewsbury Town, while Belle picked up an injury in training this week. Darryn Stamp, who came on as a substitute last Saturday, also picked up a knock playing for the reserves in the week. It remains to be seen whether either will feature tonight. One player who won’t play is Kevin Ellison who is suspended . Southend are currently sixth in the table, eight points clear of Chester, and have six home league wins under their belt this season. They are expected to name an unchanged side from the one that won 1-0 at Bury on Saturday. Two Luton Town defenders, Ian Hillier and David Bayliss, have joined City a month’s loan. The pair will be at Deva Stadium until 15th January 2005 and go straight into the squad for the League Two game at Southend United on Friday. David Bayliss is 28 year old Liverpudlian and began his career as a trainee at Rochdale. He went on to make 195+20 appearances for the Spotland club scoring nine goals. He moved to Luton in December 2001 and has made 31+10 appearances for the Hatters, scoring one goal. Ian Hillier is 24 years old and began his career at Tottenham Hotspur. He didn’t break into the first team there and moved to Luton Town in August 2001, initially on loan and then signed full time. He has so far made 39+28 appearances, scoring one goal. HIllier has also represented Wales at Under-21 level. Two goals from Shaun Whalley and another from Kevin Ellison gave City’s reserves a 3-1 over Rochdale at Deva Stadium this afternoon in a Pontins Holiday League fixture. The club have announced that tickets for the New Year’s Day game at Macclesfield Town will go on sale today to Season Ticket Holders between 10:00-19:00hrs from the ticket office with no limit on ticket purchases. The remainder of tickets will go on general sale tomorrow, Thursday 16 December, 10:00-16:00hrs only. Stand: £17.00 (adult) £12.00 (oap, under-16). Terrace: £13.00 (adult) £8.00 (oap, under-16). Harry’s funeral will take place on Tuesday 21 December at All Saints Church, Hoole Road, Chester at 13:15hrs, this will be followed by a Wake in The Frog, Liverpool Road, Upton. The local press have been carrying tributes to former manager Harry McNally in the last day or so as former players and friends paid their respects. 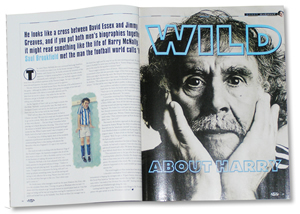 “Harry was a one off there’s no doubt about that but because of the character he was, people often forgot quite what a football man he was. He could spot a player as well as anyone out there and I for one will always be grateful for the chance he gave me. You look at the likes of Tony Kelly, Kevin Langley, Warren Aspinall, Mike Newell, John Butler and David Lowe to name just a few of the players he brought through and it's obvious what a talent he had for spotting players and getting the best of of them. It’s very sad to have to report the death of a true Chester legend, former manager Harry McNally, he was 68. Harry suffered a heart attack on Friday morning and passed away today in the Countess of Chester hospital. Former players Graham Barrow, Gary Bennett and John Kelly were at his bedside. Harry never played in the Football League but spent most if his playing career at Skelmersdale United, before going on to manage at Altrincham, Southport and Wigan Athletic. He joined Chester as manager in the summer of 1985 and, after adding Milton Graham and John Kelly, amongst others, to the squad performed a minor miracle in taking the club to promotion from Division Four in his first season, playing great football and finishing runners-up to Swindon Town. Harry will probably be best remembered though for steering Chester through the two most difficult years in their history while in exile at Macclesfield from 1990-92. He always managed to get the best from his players despite, more often or not, the odds being stacked against them. Harry’s achievement in staving off relegation, despite having to play home games 40 miles away, earned him the Manager of the Year award from The Sun newspaper in 1992. Harry certainly lived life to the full, he was a wonderful character, with a great knowledge of football in the north west, and was a frequent visitor to Deva Stadium. He will be sadly missed. Kevin Ellison has been handed a one match ban following his red card, for two bookable offences, on Saturday. The ban is immediate and so he will miss the game at Southend United on Friday night. A hat-trick from Gavin Lynch, and an own goal, helped the Chester youth team to a 4-2 home win over bottom side Notts County on Saturday morning. City have now moved into second place of the Youth Alliance North Central Conference. After serving a four match ban following his red card at Northampton, striker Cortez Belle is available again for selection for tomorrow’s all-ticket home game with Shrewsbury Town. Belle is expected to start for the Blues but one player who won’t feature tomorrow is Sean Hessey who serves a one match ban, while Darren Edmondson is doubtful with a groin injury. Darryn Stamp has returned from his loan spell at Kidderminster Harriers and will be available. City have failed to register a win in their last five League matches and can ill-afford to slip up tomorrow against a Shrews side also struggling at the wrong end of the table. Promoted with City last May, Shrewsbury currently lie below Chester in 22nd place with 18 points, five fewer than City and recently appointed Gary Peters as their new manager following the resignation of Jimmy Quinn. They have won only once on their travels, at Kidderminster Harriers, and this week have signed Tranmere winger Neil Ashton on loan for the rest of the season. He is expected to feature in tomorrow’s encounter. The ticket office is open today between 10:00-16:00hrs for ticket sales, there is no restriction on numbers that may be purchased. Please note the club say there will be NO tickets sold tomorrow on the day of the match. Season Ticket holders need not apply for a ticket but just show their pass on the turnstiles as usual. Shrewsbury have so far sold 1,150 of their 1,700 allocation. City’s reserves suffered a 1-0 home defeat to Blackpool yesterday in a Pontins Holiday League match at Deva Stadium to slip to second bottom of the league. Chester remain in 19th place in League Two after last night’s 4-1 defeat at Bristol Rovers. City never really recovered after going a goal down in the third minute, Craig Disley taking advantage as Wayne Brown failed to hold onto a Jamie Forrester shot, Disley knocking in a close-range rebound. City came back into the game gradually as the half wore on and equalised on 27 minutes through Kevin Ellison who fired home through a crowd of players after some neat build up play. However Brown conceded a penalty on the stroke of half-time as he was adjudged, by the linesman, to have brought down Forrester on the edge of the box. Richard Hope, having a good game at the time in the centre of the defence, was substituted midway through the second period, and within five minutes two more sloppy goals were conceded to condemn City to their third defeat in four matches. City currently have 20-year-old former Everton midfielder Brian Moogan on trial, he was a regular member of the Toffees’ reserve-team squad last season but released from the Goodison Park club in the summer. Manager Ian Rush welcomes back Phil Bolland, Stewart Drummond and Ben Davies from suspension as the Blues travel to play Bristol Rovers at the Memorial Stadium tonight (kick-off 19:45hrs). Darren Edmondson is suffering from a groin strain and is doubtful. Rovers, who are managed by ex-City boss Ian Atkins, lie in 15th place, just two points above City and have lost just once at home in the League so far this season. Chester’s derby match at Macclesfield Town on New Year’s Day has been made all-ticket on police advice. More details will be announced shortly. Sean Hessey picked up his fifth yellow card at Halifax Town and will serve a one match ban this Saturday, missing the home match against Shrewsbury Town. City have been drawn to play AFC Bournemouth away in the third round of the FA Cup. 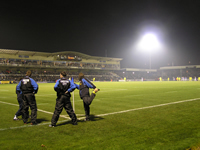 The match is scheduled to take place on Saturday 8 January 2005 at the Fitness First Stadium (Dean Court). The Cherries currently lie fifth in League One and beat Carlisle United 2-1 in the second round on Saturday after overcoming Forest Green Rovers, following a replay, in the first. Two goals either side of the break from Michael Branch helped City to a 3-1 away victory over Conference high-flyers Halifax Town in the second round of the FA Cup. There were debut’s, from the bench, for both Gavin Lynch and loan player Eddie Anaclet. City will now pick up £24,000 prize money, as well as 45% of the gate receipts, following the win. The last time City reached this stage of the competition was in 2000/01, our first Conference season, when victory’s over Easington Colliery, Plymouth Argyle and Oxford United set up a tie at Premiership Blackburn Rovers that City eventually lost 2-0. The draw for the third round, made by Gary Pallister and Tony Cascarino, will take place live on BBC TV tomorrow after the televised Hinckley United v Brentford match at 16:00hrs. Chester will be ball number 46. City have completed the signing of 20-year-old Southampton reserve midfielder Eddie Anaclet on loan, and in time for tomorrow’s second round FA Cup match at Halifax Town. Anaclet was born in Tanzania and came through the youth ranks at Oxford United. Although a midfielder he can also play on the wing. The Blues have a chronic striker shortage at present with Darryn Stamp out on loan, Michael Branch recovering from injury, and Cortez Belle suspended – leaving just Kevin Rapley up front for the last two matches. It will be a tough test for City tomorrow who could be backed with around 1,000 fans at The Shay. Halifax have already disposed League Two side Cambridge United in the first round and currently lie third in the Conference, they also have two ex-City players in their ranks with Ryan Sugden and Matt Doughty. The second round prize money up for grabs is £24,000. For those who want to listen to internet commentary of tomorrow’s game they can do this through this FA website link. Chairman Steve Vaughan has said that the club will table a substantial bid for Yeovil Town striker Phil Jevons. The offer may also include a player as part of the exchange. “Phil is the sort of quality player who would improve our squad. I will be contacting Yeovil and making a substantial offer for the lad. He has played with Michael Branch during their time together at Everton, and we hope to have him on board quickly.” said Vaughan. Both Ian Rush and Mark Aizlewood are set to lose their Welsh under 17 coaching roles. New Welsh manager John Toshack has streamlined down the national coaching staff from 13 to 6 with Brian Flynn taking over the under 17 role. Full story here. Despite a spirited second half performance, City were knocked out of the LDV Vans Trophy 1-0 by rivals Wrexham at Deva Stadium last night. A solitary first-half goal from Juan Ugarte was enough to seperate the sides in a pulsating game. After a disappointing first-half display from City manager Ian Rush introduced Robbie Booth at half-time and the change up front was dramatic. He set up three chances in the opening five minutes after the break and was instrumental in a rejouvinated City almost levelling on at least three occasions. Kevin Ellison hit the bar and Booth himself saw a close range effort cleared off the line and Phil Bolland will still be wondering now how he managed to steer a last-minute free header wide! City must now pick themselves up quickly as they have another tough match on Saturday when they visit Halifax Town in the second round of the FA Cup. The squad resources will be stretched to the limit at the Shay as Cortez Belle, Phil Bolland, Stewart Drummond and Ben Davies are all suspended for the match. It remains to be seen whether a striker can be brought in on loan in time and whether Michael Branch will have recovered from injury to take his place in the squad. A youthful looking reserve side lost 5-1 at Shrewsbury Town today in a Pontins Holiday League game. Ian Lathom scored City’s consolation goal direct from a corner. Chester City: Ryan Brookfield, Danny Ventre, Karl Carney, Mike Walsh, Matty Cooke, James Scales, Sean Whalley, Adam Wade, Gavin Lynch, Kieran Dean, Ian Latham. Subs: Ken Rollinson, James Salkeld, Mark Cadwallader, Dave McCoy. Tickets for the home match against Shrewsbury Town on 11 December will be available from the club office between 10:00-16:00hrs next Monday–Friday. Normal matchday prices apply. Note that current season ticket holders do NOT need to purchase a ticket for this match.